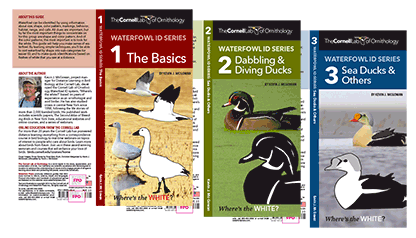 The examples on this page are samples of the work I have done as a graphic designer working either for the Cornell Lab of Ornithology or as a freelance designer. 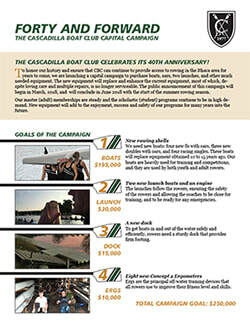 Cascadilla Boat Club provides rowing opportunities to scholastic and masters rowers. In 2018, they embarked on a capital campaign. I designed, edited, created the oar graphics, and assisted with writing this report. The capital campaign case statement for the Cornell Lab of Ornithology's "Discover" campaign won the 2013 CASE Circle of Excellence Gold Award in the "Annual Report" category. Click here or click the image to view the complete PDF (23 MB). 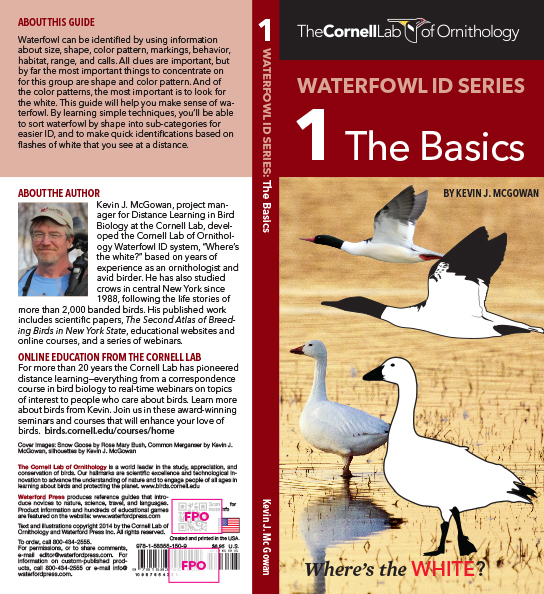 (2015) The three booklets in this new set of guides were produced by Waterford Press and written by Cornell Lab staff. The covers were designed by me and Press did the layout on the inside panels. Click here or click the image to view a larger version of Part 1. 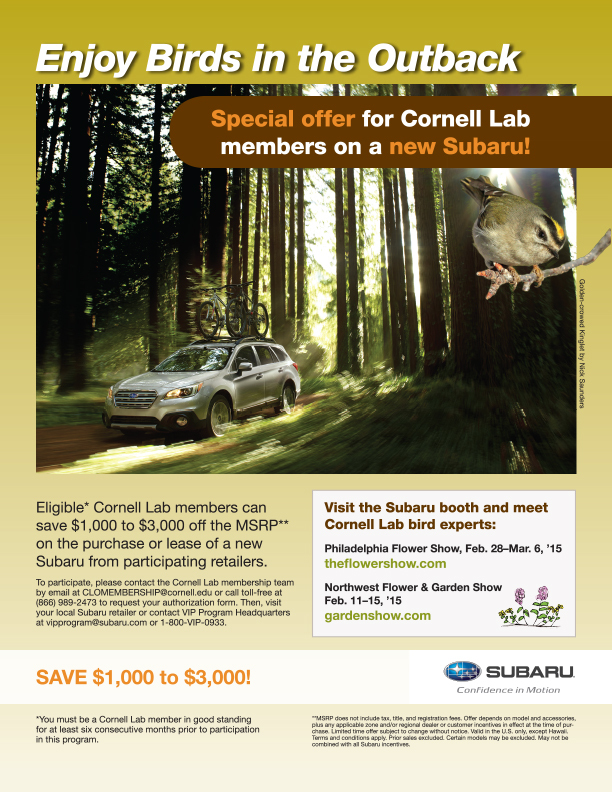 Every year, mid-level donors are invited to a special weekend at the Cornell Lab of Ornithology where they learn about the exciting things that are going on at the Lab. The art was done by a student art intern. Click here or click the image to view the complete PDF of the invitation (< 1 MB). Click here to see the reply card. 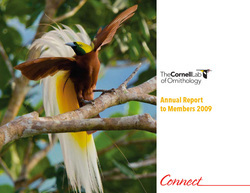 Annual report for the Cornell Lab of Ornithology (2009). Subsequent annual reports were created by other designers that I supervised, following a similar layout. Click here or click the image to view the complete PDF (2 MB). 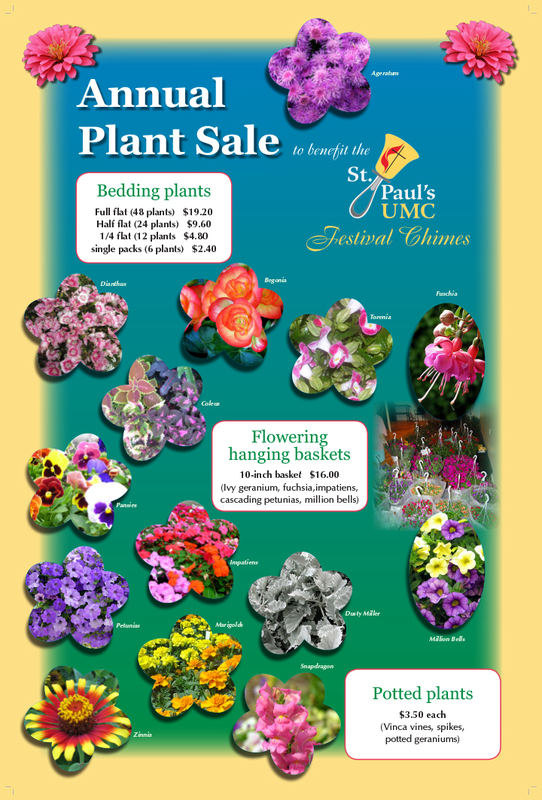 This poster was created for the hand bell choir at St. Pauls UMC Festival Chimes to promote their fundraising flower sale (2013). 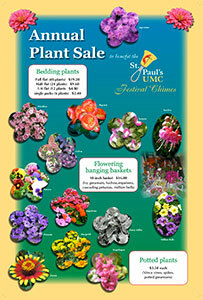 The poster was designed and printed with a laminated surface so that updated plant lists and prices could be easily reprinted and glued over the white boxes. Photos were either taken by me or stock photos, and the logo was designed by me. Click here or click the image to view a larger image. (< 1 MB). 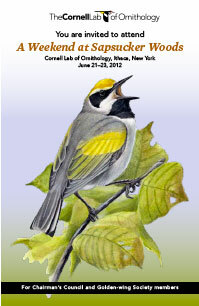 Second redesign for BirdScope, the newsletter of the Cornell Lab of Ornithology (2009-2012). With this redesign, the goal was to use more color while keeping costs down. This redesign used newsprint and a tabloid format to achieve our objectives and also give an urgency and newsworthiness to the publication. I created the new design, and did layout, photo adjustment, and photo extraction/montage for many issues, but also supervised other designers who created subsequent issues using this template. Click here or click the image to view the complete PDF (9 MB). This is the first redesign for BirdScope, the newsletter of the Cornell Lab of Ornithology (2003-2008). This was an 8-1/2 x 11-inch newsletter printed on 60# opaque stock. Click here or click the image to view the complete PDF (2 MB). I created the new design and did layout, photo adjustment, and photo extraction/montage for all issues. I also wrote an article in this issue (see pages 12-13). The Handbook of Bird Biology (2004) is a 1,200-page college-level textbook that I designed. Although most of the layout for the book, quizzes, CD booklet, CD label, and envelope was by me, I also supervised the layout work of other designers for several chapters. View a sample chapter here (2MB). The book is now out-of-print. Sew Kreations was an Etsy business that specialized in custom-made country-style sewn items. The image above was used for the banner on Etsy, and the card at left was used as a business card template. The owner of Sew Kreations was fond of Scottie dogs and chose that breed to be her mascot. I designed the Project Puffin web site to harmonize with Audubon's site at that time. 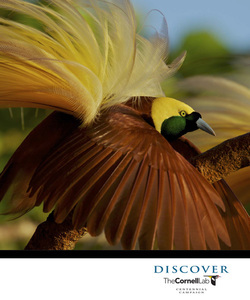 Audubon has since redesigned their site and chapters and affiliates must now create sites based on Audubon's templates. Now, this site only exists on the internet archive.